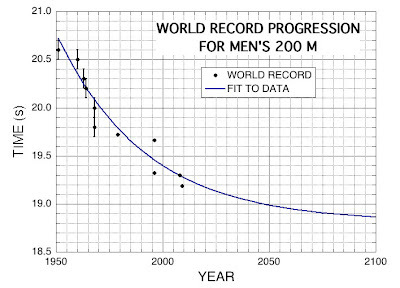 Fitting an exponential function to the data on men's 200 m world record progression. On August 20, 2009, the Jamaican sprinter Usain Bolt set again a world record of 19.19 seconds in the 200-m sprint at the World Championships held in Berlin, adding to the gold he won in the 100 m.
I have taken the data on men's 200-m world record from Ref. 1, and have tried the least squares fit of an exponential function to the data. The best-fit curve obtained are shown in the above figure together with the data used. The result shows that the limiting value of the record would be 18.81 seconds. The computation of the fit has also yielded the probable error of plus or minus 0.52 seconds for this value, though the error larger than plus 0.38 seconds cannot actually happen. This indicates that the accuracy of the prediction of the limiting value by such curve fitting is quite poor. Last revised: August 26, 2009. A ceremony of handing the Presidential Medal of Freedom from U. S. President, Barack Obama, to its recipients was performed on August 12, 2009. The Presidential Medal of Freedom is America's highest medal awarded to civilians in the world. In Japan, they broadcast this news on NHK TV, but highlighted only one of the recipients, Dr. Joseph Medicine Crow. Dr. Crow, 95 years old, is the last living Plains Indian war chief, and author of works on Native American history and culture who has served as an inspiration to young Native Americans across the country . Surely, the choice of him is symbolic of Obama's attitude to value the diversity of society. Regrettably, however, I could not learn from the broadcast that Stephen Hawking was also among 16 recipients. I learned it later from other news sources [2, 3]. Hawking is an internationally-recognized theoretical physicist who has a severe physical disability due to motor neuron disease (for more details, see his Web site ). In addition to his pioneering academic research in mathematics and physics, his citation  refers to the fact that he penned three popular science books, including the bestselling A Brief History of Time. It also mentions about his publication of a children’s science book with his daughter as well as his unlocking new pathways to discovery and inspiring everyday citizens. K. Brandon, "2009 Medal of Freedom Recipients," The Briefing Room Blog of the White House (July 30, 2009). H. Johnston, "Hawking hits the headlines in the US…," physicsworld.com blog (August 13, 2009). G. P. Collins, "Stephen Hawking receives Presidential Medal of Freedom," scientificamerican blog (August 14, 2009). "President Obama Names Medal of Freedom Recipients: 16 Agents of Change to Receive Top Civilian Honor," The Briefing Room of the White House (July 30, 2009). World record progression for men's 100 m. Data, from Ref. 1; dotted line, least-squares fit of exponential function to data through 2005; red line, fit to data through 2008; and purple line, fit to data through 2009. (You can see the real size image by clicking on the image). 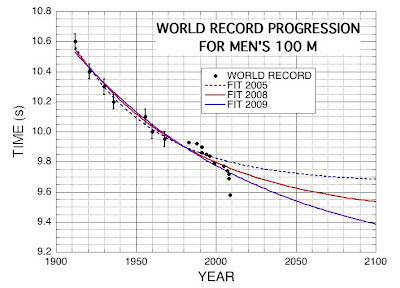 Until the year of 2005, the plot of the world record for men's 100 m sprint as a function of year allowed a good fit by an exponential function with an additive constant, value of which meant the possible limiting value of the record. The data through 2005 gave the limiting value of 9.66 seconds. The data through 2008, however, predicted an improved limiting value of 9.43 seconds owing much to Usain Bolt's record, in the Beijing Olympic Games, of 9.69 seconds, which was one of outliers with respect to the fitted curve (Ref. 2). Now his record of 9.58 seconds in Berlin on August 16, 2009, again changed the limiting value down to 9.09 seconds (with errors of plus or minus 0.49 seconds). When a single new record affects the possible limiting value this much, it would mean the following two facts: (1) The application of exponential fitting to data on men's 100 m sprint is completely inadequate. (2) Bolt's running ability is extraordinarily and exceptionally wonderful. Originally the title of this article was "Bolt's World Record Changes Statistical Prediction Again," but I replaced the word "Statistical" by "Empirical." The reason is this: The method used is often called statistical, but I think it better to be called empirical. Further, I'm not a statistician but a maker of empirical formulas. A related blog article appeared: Michael Banks, Bolt out of the blue, physicsworld. com (August 17, 2009). Read also Bolt's New 200-m Record and the Limiting Value. "World record progression 100 metres men," Wikipedia, The Free Encyclopedia (18 August 2009 at 00:44). "World Records for Men's 100 m Defy Simple Curve Fitting (2)" Femto-Essays (September 14, 2008). Last revised: August 24, 2009.